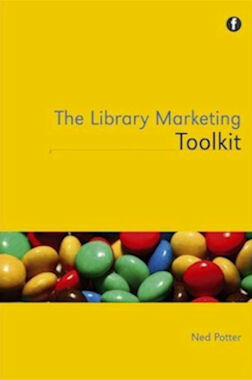 I authored The Library Marketing Toolkit (Facet Publishing, 2012). This features 27 case studies from fantastic contributors around the world, including organisations like the New York Public Library, the British Library, the National Archive, University of Cambridge, and JISC, and individuals like David Lee King, Aaron Tay, Terry Kendrick and Rosemary Stamp. The Toolkit has topped Amazon's Library bestseller charts on both sides of the Atlantic. I have also written various articles, provided a column for Library Journal, and contributed to others' books, including Bethan Ruddock's New Professionals Toolkit and Ben Bizzle's forthcoming Start a revolution: stop acting like a Library. Follow this link for a full list of publications. Facet Publishing have kindly given me special dispensation to make four chapters of the book available via Open Access. These can be downloaded from the White Rose Research Online repository. Follow the links for Chapter 1: Essential Marketing Tools | Chapter 2: Strategic Marketing | Chapter 4: Marketing With Social Media | Chapter 6: Internal Marketing. This book is quite an achievement. It is inter-generational, addresses all library sectors, introduces marketing concepts in language that is readily understood. It would make a good supporting text to library management and marketing studies and to those charged with marketing library and information services. Its ideas are applicable to the wider GLAM sector (galleries, libraries, archives, museums). The questions for me on opening this book were “do we need another book on marketing libraries”, and “does this one offer anything different?” And I am happy to say that this is not a traditional marketing text. It offers a contemporary perspective on what marketing means for libraries now. Practical application is the major strength of this book – the 27 case studies that are interwoven in the various chapters provide the narrative which bring the text to life. These are the stories which ring true, and give us the ideas and aha! moments which inspire us. The real skill of the author has been in posing the questions to focus the readers’ attention on the gems of wisdom, illuminating ideas, unique and clever applications. A “case study matrix” in the introductory chapter sets them out by title, author, sector, chapter, and key themes. So to go back to my original questions – my answers are “yes we do need another book on marketing libraries” and “yes it does offer something different”. We live in changing times and even if basic marketing theory does not change, the way we market ourselves and our libraries does change. In addition to the need to continually learn about how to apply the many new and constantly evolving social technology tools, the need has never been more critical for libraries to be positioning themselves in the marketspace where our clients are. This is increasingly in the online world of social media, but this is also where our competitors are. So to maintain our competitive edge and manage the perceptions of our clients and funders, we need to make sure that we are using all the relevant tools that we can lay hands on, at the same time demonstrating and communicating our value in terms that are meaningful to our stakeholders.